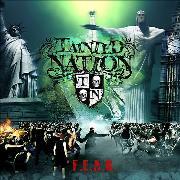 TAINTED NATION is a new acquaintance to me, but Messrs. Pete Newdeck, vocals (! ), Ian Nash, guitars, Pontus Egberg, bass, and Mark Cross, drums, sure are not. Pete has been/is the drummer in bands like GRIM REAPER, PAUL DI`ANNO, and of cause EDEN`S CURSE, Ian is most known for GRIM REAPER, Pontus is in THE POODLES and Mark Cross is/has been involved in HELLOWEEN, MARCO MENDOZA and FIREWIND. Strangely enough this seasoned stew has a go at modern rock, and with a touch of AOR?! I have seen Pete live a few times, but never heard him sing lead. He is a bit of a surprise here, and he does it with a pinch of OZZY back in the eighties in his voice. The first five tracks we´re on the most positive side. They all rock and the groove is there, the refrains are fine and it´s still very modern sounding. “Hell Is a Lie” is the first less inspiring track, but I think that is due to the messy arrangement. I quite expected this to more in the vein of “Don´t Tell Me”, which is more classic in style, but that fine track is an exception! There is actually AOR in “What Are You Waiting For”, AOR meets the 21st century, and does marry well. I also thought more of “Never Promised You Anything”, which feature Ted Poley, but that one has some pop thrown in, and don’t latch on with me. But never mind those two downsides, this album is almost entirely filled to the brim with convincing modern hard rock!